IMAGINE THIS - living at the historical BOSE FARMS in Cloverdale! 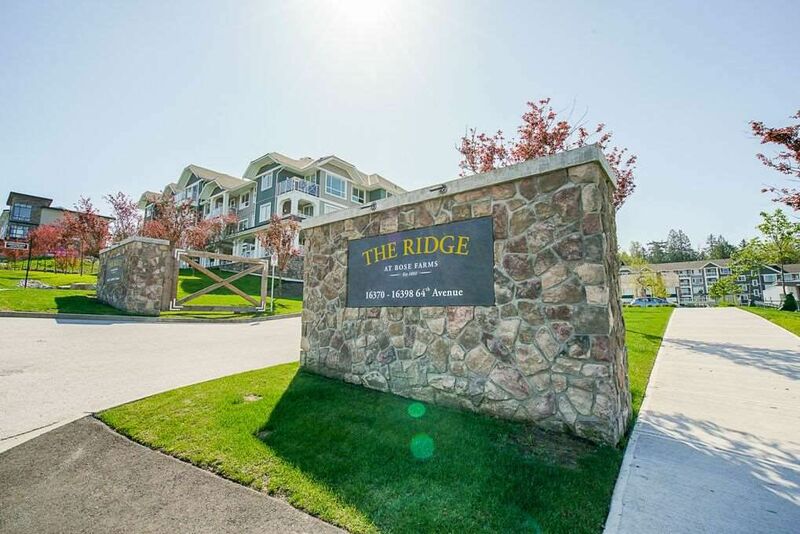 This gorgeous, quiet 2 Bedroom/1 Bath 740 sq ft condo unit at THE RIDGE overlooks the courtyard community gardens, playground and heritage home and surrounded by 12 acres of trails & natural forest dedicated to the City of Surrey known as the Bose heritage Forest. Boasting 9' ceilings in open concept; modern quartz kitchen & island; laminate flooring; carpeted and separated Bedrooms; double sink/quartz counter/tiled Bathroom; and spacious covered balcony for year round use! The restored heritage buildings house the amenities including fitness centre/yoga room/theatre/library/craft room and Guest Suites! Close to schools, shopping, and golf!